Brazil announced Wednesday it is withdrawing its offer to host the COP25 UN climate conference next year, citing financial constraints. The news comes just days before the start of COP24, this year's annual climate conference being held in Katowice, Poland. "Considering the current financial and budgetary restrictions, which are expected to continue in the near future, and the process of transition for the recently elected administration ... the Brazilian government feels obliged to rescind its offer to host COP25," the foreign ministry said in a statement. President-elect Jair Bolsonaro, who will assume office on January 1, has threatened to withdraw Brazil from the Paris climate accord while also vowing to remove restrictions on the agribusiness sector accused of causing untold devastation to the environment, in particular the Amazon rainforest. Earlier this month, Bolsonaro appointed career diplomat Ernesto Araujo as his new foreign minister, a man who this week hit out at "climate scare-mongering" in an article in the Gazeta do Povo newspaper. "The Brazilian government has carried out a meticulous analysis of the requirements to host COP25. The analysis focuses, in particular, on the financial necessities associated with hosting this event," added the foreign ministry. COP25 was due to take place from November 11-22, 2019. Writing in his personal blog, Araujo -- a fan of US President Donald Trump, who has already pulled his country out of the Paris climate accord -- hit out at Brazil's political left for "kidnapping the environment cause and perverting it to the point of seizure." He accused the left of creating a "climate change ideology." The decision is "regrettable but not surprising," climate think tank Observatorio del Clima said. "It's probably due to the elected government, which has already declared war on sustainable development on more than one occasion. "It's not the first, nor will it be the last bad news from Jair Bolsonaro in this domaine." The think tank said Bolsonaro's regime would be "desisting from protecting the population" in denying climate change. Earlier this week, Greenpeace said deforestation in Brazil was worsening, with an area equivalent to one million football pitches cleared in just one year from August 2017 to July 2018. 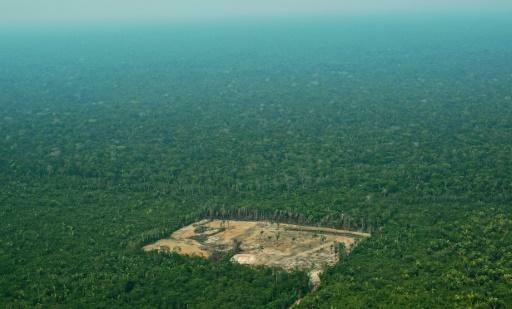 Deforestation increased by 14 percent in that period. "Every year we have this news that forest is being criminally deforested," Marcio Astrini, the public policies coordinator for Greenpeace Brazil, told AFP.